A week of learning and fun during the High Alpine Skills Course run by the NZAC. After sitting out a front at Unwin Hut practicing glacier travel around and prusiking inside the hut on, day 2 saw us moraine bashing up the Tasman to our bivvy site below De la Beche Hut. Early the next day we headed to a basin below Mt Green to find some snow to play with. Racing a north westerly front, we hurried down the Tasman in the afternoon fighting 80-90 km/h gusts to grovel up the moraine wall to De la Beche Hut, where we were based the next three nights. Ball Terrace with Ball Shelter on the left. 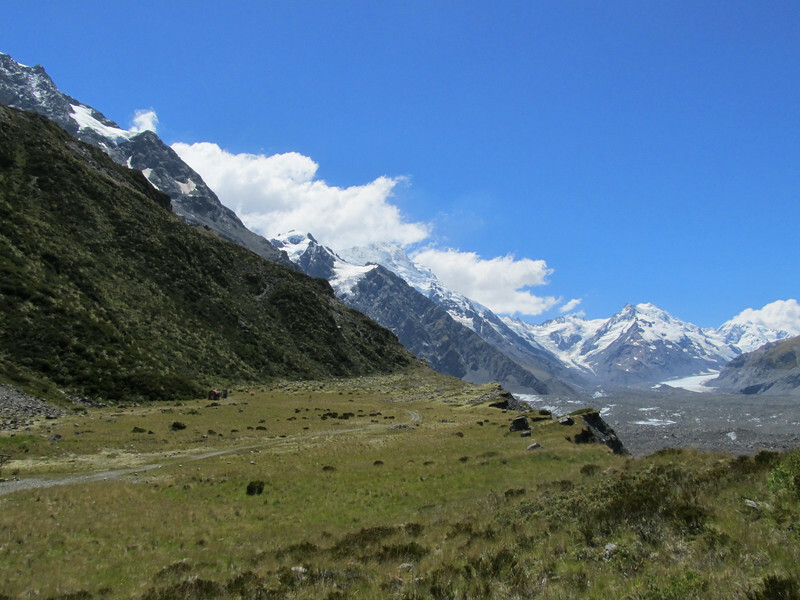 We traveled through the Tasman moraine on the right. De la Beche Hut is just above the white ice on the ridge to De La Beche.